I would like to introduce a being of Light to you. This is someone you have never spoken with before, nor has he contacted anyone on the Earth plane before today, but as you would say, times they are a-changin’. My Brother Randor, who was the Creator of the Omarrhan Universe, has been very interested in the developments on Terra, because of course it was his Universe which spawned the dark ones who have been such a challenge to all of you in this civilization. As I told you in a previous message (“How Our Universe Began, and The Invasion from Omarrhan”), Omarrhan is no more, because it was necessary to dissolve the entire project in order to halt the spread of the darkness and destruction that threatened to create havoc in the entire Multiverse. With the direct oversight of One, those incarnated beings who could be moved were taken off the planets where they had been living, and were eventually dispersed to other places around the cosmos, including some of the earliest planets in our Universe. Others simply decided to depart their bodies and return to One. The only ones who refused to return to the Light were those who escaped at the last moment in their ships and managed to cross the boundary into our Universe, where they set their sights on establishing bases from which to dominate and eventually take over the entire Universe. I would not have permitted this to happen, but we do not simply attack and annihilate living beings because they might be dangerous at some future date. Our principle of nonintervention guides us to tolerate, and where necessary, control the offending beings in whatever way we find most effective. In the case of the groups of dark ones who had loosely organized to divide up the territories, mostly in your galaxy, we took an approach of cautious optimism, and we began a program of containment, diplomacy, and infiltration to try to bring them back to the option of being included as respected members of the greater society. You, Dearest Ones, were the race and the civilization where this project was to reach its completion. And so it has. You are now in the clean-up phase of extracting yourselves from the toxic ideas and the toxic environmental effects they have left behind. The efforts to rehabilitate and return them to the Light have resulted in successful peace treaties with some factions, rehabilitation programs for those who agreed to come to the Light rather than be dissolved themselves, and the unfortunate dissolution of the others who would not agree to abide by Universal Laws but continued to threaten nuclear disaster for all beings throughout the Multiverse. Many of you know the story of the end of the Lucifer Project, which was documented in these pages and on BlogTalkRadio around the August 22, 2013 celebration of the return of the Reptilian species under the leadership of Prince Reginald, Mother/Father God, and Lucifer himself. I will not review here the heroic work of humankind, who harbored the recalcitrant Reptilians in their own bodies for three generations to help them learn Love and Compassion. I recommend that you learn the story of this difficult and sometimes life-threatening challenge, which resulted in the rescue of nearly one million Reptilians, who will be among your mentors and teachers in the coming years. Now, I will turn this over to Randor, my beloved Brother and friend, who has important information for you. Welcome to our world, Randor. Randor: Thank you, dear Brother. Kathryn: (I am taking a moment to recalibrate. Randor’s energy is very high frequency. At first it was giving me a dizzy headache, so I needed to expand, reach upward inside my brain to accommodate Randor’s vibration.) Welcome, Randor. I am honored to be talking with you. I will write down your words just as you speak them to me. I am Randor, the Creator who was responsible for the races of dark ones who have given you so much trouble here in the Milky Way galaxy. I have not spoken to you during this incarnation, but I am not really a stranger to some of you. I am here to make contact with you out of Love. It is a very moving experience to be here with our beloved Masters who are surrounding me now, and with all of you who are now reading my message to you. It feels like a homecoming, doesn’t it? For many of you, I am what you might call a long lost Uncle, and for others, I am the Creator who gave birth to you, many eons ago. I watched over you in the days of your beginnings as a soul; I was the one who taught you the Laws of the Cosmos, and it was I who helped you to separate into the male and female elements which would become your essential beings for the travels and lessons you were preparing for in your evolution as souls. You have never been out of my thoughts or my heart, for you are the adventurers I created in my likeness, with the help of One, and I have looked on in admiration as you ventured into the deep waters of life on Planet Earth. Although we do not feel “pride” as you know it, I have a deep feeling for you that is a combination of wonder, respect, and great familiarity, for you are my beloved family, Dear Ones. It is the feeling of coming full circle, back into the arms of those who have loved so long and so well. My heart overflows with Love for you, but I must not drown our dear channel in my tears of joy – it interferes with her ability to see the page she is typing. Now she is laughing at me. Ah, such joy, such happiness I feel to talk with you again, after this enormous challenge you have taken on for the good of humanity and the Cosmos. You have served faithfully and well, Beloved Children, for lifetime after lifetime in these human bodies, struggling against the concerted efforts of the Reptilians, the Anunnaki, the Greys, the Draconians, and all those whom we have called Archons, the inhabiters of your 4th dimension. They have, admittedly, made your lives miserable, but I am here now to congratulate you on your freedom. You have been given your liberation from all invading species whose intention was to enslave you in their Matrix – the web of ideas, beliefs and institutions they created to trick you into believing that their strength came from their attachment to evil. Let me explain. The problem began millions of years ago, before your Universe was created. My brother, whom I loving refer to as “O” (his soul name was Ohara), was beginning his training as a Creator, and I was well into the design and creation of Omarrhan. I was pleased with my exquisitely complex creation, the expression of elaborately interacting forces, level upon level of interwoven energies. Ah, I was in my element, you might say. One was always present for my daring experiments, and I willingly followed the lead of One who was far more experienced and knowledgeable than I was, but I was given a great deal of freedom to range far and wide in my ideas for planets and stars which would support life – the conscious beings who were a part of the Master Plan for Omarrhan. And so I created a Universe in which Freedom would be the guiding principle, along with Love and Harmony. It is a delicate balance, as you so well know in your own lives. Those of you who have children struggle with the issues every day: How much freedom is a perfect balance for a young being? How far can they be allowed to stretch the boundaries before you must reign them in? Always, I took the more lenient approach, knowing that Love was the greatest power of all, and that Light would always be the guide which would carry all of us eventually back to One. And so I decided to let go of the reins, so to speak, and allow all my children to create the environment they found most interesting and challenging. I did not know then how imaginative my beloved beings could be, but of course, they were made in the image of One, as I was, and so, as you might say, the sky’s the limit. They were the ones who requested and were allowed to design the concept of the Matrix which would include darkness as well as Light, illusion as well as Truth, and out of this design came the behavior you now call “evil.” They gave it a name, this illusory energy of darkness. They called it Saytahn. There was no being by this name. It was simply the description of the entire spectrum of rebellious impulses – those calculated forays into independence from Me, from One, and from the clear and conscious connection to Light. You see, they had become used to the idyllic and comfortable existence in Love and Light. They believed that if they were challenged more intensely, more deeply tempted to stray from our accepting embrace, they would learn to appreciate more profoundly and they would have a tremendous growth experience. We have since learned that the elements of some of my soul creations were weighted a bit too heavily toward freedom and individuation, and it left them without the anchor they needed to spring back from their painful experiences without injury to their souls. Of course, it was not a consideration in my original plan to account for painful or damaging experiences for my children. I had envisioned a Universe of Light, Love and Harmony. 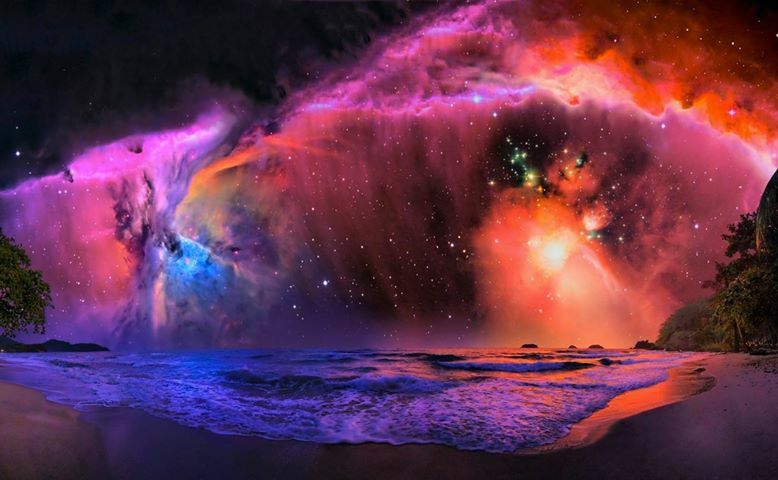 The Universe I created was one of great beauty, filled with volatile energies and counterbalancing expanses of nourishing plasma belts and colorful waves of gentle, modulating energies in which my creations could play. It was…my Love. But it was doomed to be overtaken by the dark ones who focused on creating ever more complex twists and turns in their Matrix, while they developed powerful new technologies. They advanced quickly in their technical skills, but failed to develop their spiritual connections with each other and with Us. As the eons passed, they learned to incarnate into the lower dimensions without returning to my loving embrace, a trick they carried into your Universe as well, and the gap widened between the beings of Light and those who “played on the dark side”. As you can probably imagine from my story, it went too far. While the Children of Light designed technologies to make their lives more interesting and rich, including the ability to travel to the far reaches of their galaxies, the dark ones began to develop weaponry, including extremely powerful inventions like the ones you have seen on your planet. We were not unaware of their ill-conceived projects and dark intentions, and continuously tried to work with them to teach them the simple error of their ways, but they became so set in their own illusions that they were no longer able to grasp that Light could not be defeated, ever, and that the Matrix they had come to believe in was of their own making. It was a truly tragic downward descent. My regret is that it caused such difficulty for my beloved Children of Light, who eventually were forced to leave their Home because of the dangerously destructive intentions of their wayward brothers and sisters. No one wanted to see our glorious creation destroyed, but it was finally decided in the Councils of Omarrhan, in consultation with my loving children who had become the brilliant leaders of our Universe, that there was no alternative but to abandon our beloved Home immediately, and to dissolve it back into the energy of One. Our intention was to begin again, with greater wisdom and determination to create a new Universe, with One’s help – one that would be safe for Love and Light to thrive. Our council meetings were poignant, filled with feelings of nostalgia and a kind of regret, but we never wavered in our intention to preserve what was of the Light while leaving behind everything else. It was not easy to give up on the children of my Heart, for I had never stopped loving them, even as I saw them moving down a path toward destruction. It was that connection – the pain of my heartstrings – which transmitted to the dark ones a hint of my intentions, and which perhaps caused me to hesitate just a moment as I said farewell to the ones I loved. Our Universe was gone in a flash of Light, as it was swallowed into the Void, but a few of the dark ones were able to escape, crossing the boundaries into your then-young Universe, where they became the great nuisance you have dealt with ever since. Yes, Beloved Children of my Heart, many of you are the survivors, the Warriors of the Light who came here to incarnate as human beings, to continue your valiant efforts to bring back your Brothers and Sisters to the Light, and to create a new world here, under the loving gaze of my brother Creator, Ohara. The knowledge you carry in your hearts and minds comes from your earlier experiences and challenges in Omarrhan. Our work together to contain and manage the ones who turned away from the Light laid the groundwork for your success here on Terra. We also established the loosely organized structure which became the early model for the Intergalactic Federation of Light. Your beloved Ashtar is here to continue his good work as the guardian and protector of the Beings of Light in your Universe, and to assist our dear Terra in her Ascension. You see, the Ascension of Terra marks the triumph of Light over darkness. It was inevitable that one day you would all transcend the struggles begun so long ago, but it was also the way of Universal Life that it would be done moment upon moment, with the energies of all living beings intertwined in the creation of the Great Plan. There are wonders ahead for all of you. In the billions of years since Omarrhan ceased to exist, I have not been idle. We, all the Creators of One, have been developing new Universes, new galaxies and planets which mirror your Universe and which will make it possible for you to experience the complex plan of Ascension you are now beginning. There will be new horizons, new worlds to explore, and unlimited adventures to partake in. You are now in the process of separating out Light from darkness, illusion from reality, dismantling the Matrix the dark ones brought to Terra. It is similar to the ones they created in Omarrhan, because the dark ones have little real creativity. Look closely, Beloved Ones, and you will see and feel the utter lifelessness of their beliefs and their plans. Learn to identify the monotonous melodrama that is darkness by its essence, which is anger, resentment, envy, intolerance, impatience and fear. Those feelings do not exist in the Light. We are made for and of the Light. Nothing else will remain in the higher dimensional world you have chosen to inhabit, but you must now grow into your own Vision. I am here with you in Love, and I will continue to assist in the sending of the great energies of One that will carry you through this coming phase of your wondrous journey.